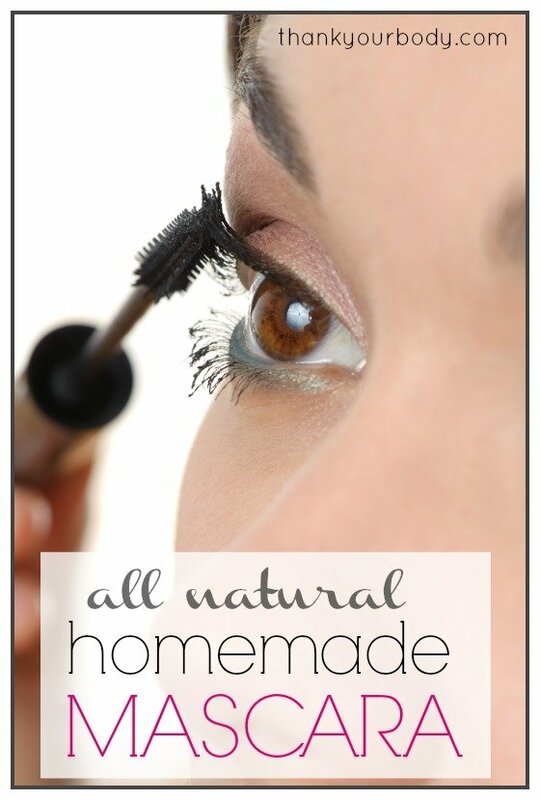 Why homemade mascara? For some time now my entire makeup routine has been a dab of lip balm and a quick brush of mascara. But I still wondered if these two little “makeup essentials” were really good for me. Being the hippie-lovin’-green-livin’ type gal that I am, I was pretty sure the answer was “no.” And that’s why I’m here to share my all natural homemade mascara recipe with you. What is in mascara anyway? Mascara dates back to ancient Eygpt. Most formulas contain the same basic elements: pigmentation, oils, and waxes. But most mascaras on the market these days have plenty of other “stuff” lurking about them. But even this (more expensive) organic brand was full of ingredients that I didn’t quite feel safe about. And I’ve been on a “make your own” kick, so why not homemade mascara? Okay, back to the homemade mascara recipe. You ready? **Activated charcoal can be found in most health food stores or online. This is not the same stuff you use to get your grill going, okay? Also, some people have responded in the comments that activated charcoal might not be good to use close to your eyes. If you’re worried, go with the cocoa powder to be safe. 1. Put coconut oil, aloe vera gel, and grated bees wax in a small saucepan over low heat. Stir until beeswax is completely melted. 2. Open 1 – 2 capsules of activated charcoal (depending on desired color, about 1/4 – 1/2 tsp) and pour into oil mixture. Stir until completely incorporated. Remove from heat. 3. Pour into a small plastic bag, pushing the mixture down to one corner. Then cut a very small hole in the opposite corner of the bag. 4. Fold the corner with the cut whole until you have a small tip that you can push into the empty mascara tube. (It’s much easier if you have an extra set of hands nearby to hold the tube in place!) Make sure the tip goes far enough into the tube or you’ll have a big mess on your hands! 5. Keep the small-hole-end securely in the tube (or get your helper to hold it in place). Begin pressing the mascara mixture toward the tube. Don’t move too quickly or it will come out and you’ll have mess to deal with. (I highly recommend doing this with a paper towel or napkin underneath.) Keep moving the mixture into the tube until it’s all in. 6. Place the inner cap in place and then twist the wand on tightly. Viola! Homemade mascara! Note: Like all mascaras, it is important that you use this homemade mascara wisely. Proper use of mascara includes disposal of tube and brush after four to six months. Homemade mascara should also be disposed of if found to smell different, strange, or especially pungent. It is unlikely and unusual, but all mascara does have the capability to grow bacteria. Make sure to keep the lid on tightly or this homemade mascara will dry out. What do you think? Are you up to trying homemade mascara? UPDATE: I had enough people ask to see what the mascara looks like on. So, here you are. I am not wearing any other makeup, just the mascara… so keep that in mind.